Kathy Bowser was the first one to purchase a VIP ticket for the upcoming Sugar Plum Stroll. POINT PLEASANT — Holiday shopping season is right around the corner and businesses along Main Street will be kicking if off the first Saturday in November. The third annual Sugar Plum Stroll is set for Saturday, Nov. 3 from 5-8 p.m along Main Street in Point Pleasant. Rebecca Farley, of Coach Rebecca, shared this event, put on by the Main Street Merchants, is being held to help stimulate the downtown economy and while doing so getting everyone in Mason County in the holiday spirit. Along with holiday festivities being held, Main Street will also be adorned with decorations and lights, a few sugar plum fairies may even been seen. Participating businesses will be offering special deals for the shoppers as well as holiday treats such as cookies, hot cocoa, and cider. A crowd favorite, Sugar Plum Stroll Bingo, will be returning this year. Each shopper will be given a bingo card and the goal will be for the individual to visit each participating business to receive a stamp in order to be eligible to win a gift basket full of goodies from the businesses. If a shopper makes a purchase at the business, the individual will receive extra tickets towards winning the prize. Participating businesses this year are Coach Rebecca, All About You Salon, Siders Jewelers, M&Z Boutique, Mason Jar, Willa’s Bible Bookstore, Lowe Hotel, Four Seasons Florist, Victoria’s Prom & Bridal Shop, Shabby to Chic, Mothman Museum, Bordman’s Furniture, Counter Point Cooperative, People’s Bank, Gallery at 409, Makers Loft, Solid Rock Studios, Point Pleasant Register, Main Street Sweets, Fringe Salon, Exclusive Reality, The Coffee Grinder, Faithful and Free, and Rio Bravo 2. New to the stroll this year will be VIP tickets for “swag bags.” The tickets, $25 a piece, are currently on sale at participating businesses, excluding Rio Bravo 2 and Exclusive Reality, with only 200 being sold. The swag bags will be filled with items and/or exclusive discounts from participating businesses as well as a commemorative Sugar Plum Stroll ornament. The swag bags are valued over $200. All the funds raised from these tickets will be going towards future events the Main Street Merchants will be hosting. For everyone who purchases a ticket, a reception will be held at Gallery at 409, beginning at 4:30 p.m., for these individuals to browse the items of their swag bags. Also, the merchants are working on incorporating a pop-up shop along Main Street to accommodate some independent businesses. Farley commented she hopes to see this event grow even more next year by having more businesses involved. She wants to see Main Street continue to thrive, reaching its optimal potential. 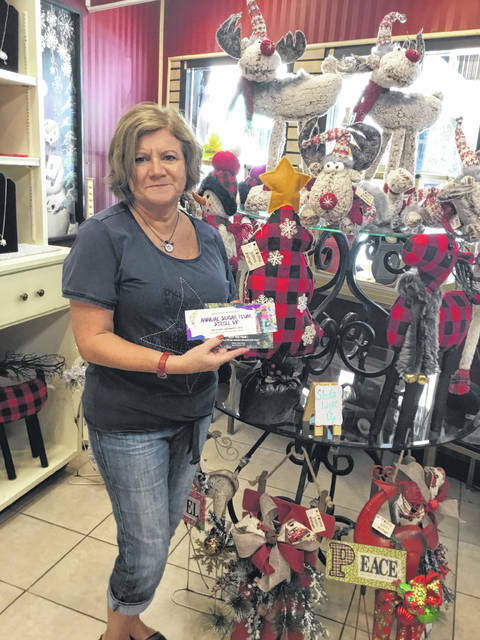 https://www.mydailysentinel.com/wp-content/uploads/sites/14/2018/10/web1_SugarPlum-1.jpgKathy Bowser was the first one to purchase a VIP ticket for the upcoming Sugar Plum Stroll.